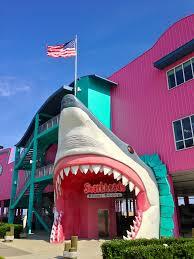 Sharkheads Souvenir City is the Mississippi Gulf Coast’s premier gift shop. The shop originally opened in 1977 and grew throughout the years to a 35,000 square foot shop. The landmark 32 foot great white sharkhead in the front is a unique picture opportunity. From novelty T-Shirts to shot glasses and everything in between, the wide variety of merchandise makes finding something for everyone a breeze. Sharkheads is open 12 months a year and carries winter gifts as well as summer/ beach oriented products. You can also find brand name merchandise such as Quiksilver and Roxy. And be sure to to try their delicious homemade fudge.